readtext: An easy way to read text data into R, from almost any input format. spacyr: NLP using the spaCy library, including part-of-speech tagging, entity recognition, and dependency parsing. 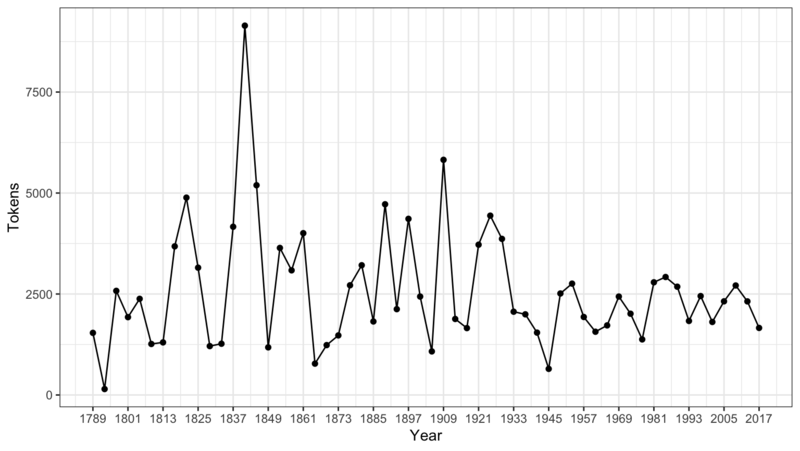 quanteda.corpora: Additional textual data for use with quanteda. quanteda.dictionaries: Various dictionaries for use with quanteda, including the function liwcalike(), an R implementation of the Linguistic Inquiry and Word Count approach to text analysis. You load the package to access to functions and data in the package. quanteda has a simple and powerful companion package for loading texts: readtext. The main function in this package, readtext(), takes a file or fileset from disk or a URL, and returns a type of data.frame that can be used directly with the corpus() constructor function, to create a quanteda corpus object. a VCorpus corpus object from the tm package. a data.frame containing a text column and any other document-level metadata. The simplest case is to create a corpus from a vector of texts already in memory in R. This gives the advanced R user complete flexibility with his or her choice of text inputs, as there are almost endless ways to get a vector of texts into R.
If we already have the texts in this form, we can call the corpus constructor function directly. 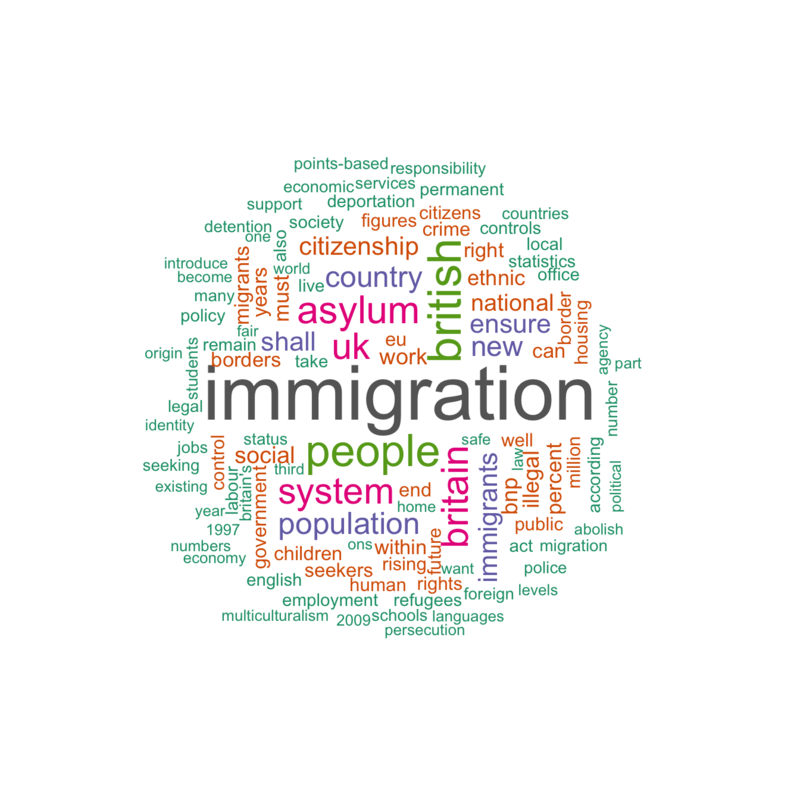 We can demonstrate this on the built-in character object of the texts about immigration policy extracted from the 2010 election manifestos of the UK political parties (called data_char_ukimmig2010). If we wanted, we could add some document-level variables – what quanteda calls docvars – to this corpus. We can do this using the R’s names() function to get the names of the character vector data_char_ukimmig2010, and assign this to a document variable (docvar). If we wanted to tag each document with additional meta-data not considered a document variable of interest for analysis, but rather something that we need to know as an attribute of the document, we could also add those to our corpus. The last command, metadoc, allows you to define your own document meta-data fields. Note that in assigning just the single value of "english", R has recycled the value until it matches the number of documents in the corpus. In creating a simple tag for our custom metadoc field docsource, we used the quanteda function ndoc() to retrieve the number of documents in our corpus. This function is deliberately designed to work in a way similar to functions you may already use in R, such as nrow() and ncol(). A corpus is designed to be a “library” of original documents that have been converted to plain, UTF-8 encoded text, and stored along with meta-data at the corpus level and at the document-level. We have a special name for document-level meta-data: docvars. These are variables or features that describe attributes of each document. A corpus is designed to be a more or less static container of texts with respect to processing and analysis. This means that the texts in corpus are not designed to be changed internally through (for example) cleaning or pre-processing steps, such as stemming or removing punctuation. Rather, texts can be extracted from the corpus as part of processing, and assigned to new objects, but the idea is that the corpus will remain as an original reference copy so that other analyses – for instance those in which stems and punctuation were required, such as analyzing a reading ease index – can be performed on the same corpus. To extract texts from a corpus, we use an extractor, called texts(). ## "Fellow citizens, I am again called upon by the voice of my country to execute the functions of its Chief Magistrate. When the occasion proper for it shall arrive, I shall endeavor to express the high sense I entertain of this distinguished honor, and of the confidence which has been reposed in me by the people of united America.\n\nPrevious to the execution of any official act of the President the Constitution requires an oath of office. This oath I am now about to take, and in your presence: That if it shall be found during my administration of the Government I have in any instance violated willingly or knowingly the injunctions thereof, I may (besides incurring constitutional punishment) be subject to the upbraidings of all who are now witnesses of the present solemn ceremony.\n\n "
To summarize the texts from a corpus, we can call a summary() method defined for a corpus. The + operator provides a simple method for concatenating two corpus objects. If they contain different sets of document-level variables, these will be stitched together in a fashion that guarantees that no information is lost. Corpus-level meta-data is also concatenated. ##     2001-Bush   621   1808        97 2001      Bush George W.
##     2005-Bush   773   2319       100 2005      Bush George W.
##    2017-Trump   582   1660        88 2017     Trump Donald J. ## Source: Gerhard Peters and John T. Woolley. The American Presidency Project. ##  of runaway living costs. In the above summary, Year and President are variables associated with each document. We can access such variables with the docvars() function. ##  "Gerhard Peters and John T. Woolley. The American Presidency Project." ##  "Tue Jun 13 14:51:47 2017"
More corpora are available from the quanteda.corpora package. In order to perform statistical analysis such as document scaling, we must extract a matrix associating values for certain features with each document. In quanteda, we use the dfm function to produce such a matrix. “dfm” is short for document-feature matrix, and always refers to documents in rows and “features” as columns. We fix this dimensional orientation because it is standard in data analysis to have a unit of analysis as a row, and features or variables pertaining to each unit as columns. We call them “features” rather than terms, because features are more general than terms: they can be defined as raw terms, stemmed terms, the parts of speech of terms, terms after stopwords have been removed, or a dictionary class to which a term belongs. Features can be entirely general, such as ngrams or syntactic dependencies, and we leave this open-ended. To simply tokenize a text, quanteda provides a powerful command called tokens(). This produces an intermediate object, consisting of a list of tokens in the form of character vectors, where each element of the list corresponds to an input document. tokens() is deliberately conservative, meaning that it does not remove anything from the text unless told to do so. ## tokens from 2 documents. ##   "This"      "is"        "$"         "10"        "in"
##   "999"       "different" "ways"      ","         "up"
##  "and"       "down"      ";"         "left"      "and"
##   "@kenbenoit"     "working"        ":"              "on"
##   "#quanteda"      "2day"           "4ever"          ","
##   "http"           ":"              "/"              "/"
##  "textasdata.com" "?" "page"           "="
##   "This"      "is"        "in"        "different" "ways"
##   "up"        "and"       "down"      "left"      "and"
##  "@kenbenoit"     "working"        "on"             "#quanteda"
##  "2day"           "4ever"          "http"           "textasdata.com"
##   "This"      "is"        "10"        "in"        "999"
##   "different" "ways"      "up"        "and"       "down"
##   "@kenbenoit"     "working"        "on"             "#quanteda"
##   "2day"           "4ever"          "http"           "textasdata.com"
##   "This"      "is"        "$"         "in"        "different"
##   "ways"      ","         "up"        "and"       "down"
##  ";"         "left"      "and"       "right"     "!" ##   "This"      " "         "is"        " "         "$"
##   "10"        " "         "in"        " "         "999"
##  " "         "different" " "         "ways"      ","
##  "\n"        " "         "up"        " "         "and"
##  " "         "down"      ";"         " "         "left"
##  " "         "and"       " "         "right"     "!" ##   "@kenbenoit"     " "              "working"        ":"
##   " "              "on"             " "              "#quanteda"
##   " "              "2day"           "\t"             "4ever"
##  ","              " "              "http"           ":"
##  "/"              "/"              "textasdata.com" "?" ##  "page"           "="              "123"            "." ## tokens from 1 document. ##   "G" "r" "e" "a" "t" "w" "e" "b" "s" "i" "t" "e" ":" "h" "t" "t" "p"
##  ":" "/" "/" "t" "e" "x" "t" "a" "s" "d" "a" "t" "a" "." "c" "o" "m"
##  "?" "p" "a" "g" "e" "=" "1" "2" "3" "." ##   "G" "r" "e" "a" "t" " " "w" "e" "b" "s" "i" "t" "e" ":" " " "h" "t"
##  "t" "p" ":" "/" "/" "t" "e" "x" "t" "a" "s" "d" "a" "t" "a" "." "c"
##  "o" "m" "?" "p" "a" "g" "e" "=" "1" "2" "3" "." ## tokens from 3 documents. ##  "Kurt Vongeut said; only assholes use semi-colons." ##  "Today is Thursday in Canberra:  It is yesterday in London." ##  "En el caso de que no puedas ir con ellos, ¿quieres ir con nosotros?" Tokenizing texts is an intermediate option, and most users will want to skip straight to constructing a document-feature matrix. For this, we have a Swiss-army knife function, called dfm(), which performs tokenization and tabulates the extracted features into a matrix of documents by features. Unlike the conservative approach taken by tokens(), the dfm() function applies certain options by default, such as tolower() – a separate function for lower-casing texts – and removes punctuation. All of the options to tokens() can be passed to dfm(), however. ## Document-feature matrix of: 7 documents, 5 features (0.0% sparse). ## 7 x 5 sparse Matrix of class "dfm"
Other options for a dfm() include removing stopwords, and stemming the tokens. ## Document-feature matrix of: 7 documents, 5 features (17.1% sparse). ##   "i"          "me"         "my"         "myself"     "we"
##   "our"        "ours"       "ourselves"  "you"        "your"
##  "yours"      "yourself"   "yourselves" "he"         "him"
##  "his"        "himself"    "she"        "her"        "hers"
##   "и"   "в"   "во"  "не"  "что" "он"  "на"  "я"   "с"   "со"
##   "فى"  "في"  "كل"  "لم"  "لن"  "له"  "من"  "هو"  "هي"  "قوة"
The dfm can be inspected in the Environment pane in RStudio, or by calling R’s View function. Calling plot on a dfm will display a wordcloud. ## Document-feature matrix of: 9 documents, 1,547 features (83.8% sparse). ## Document-feature matrix of: 5 documents, 10 features (0.0% sparse). ## 5 x 10 sparse Matrix of class "dfm"
For some applications we have prior knowledge of sets of words that are indicative of traits we would like to measure from the text. For example, a general list of positive words might indicate positive sentiment in a movie review, or we might have a dictionary of political terms which are associated with a particular ideological stance. In these cases, it is sometimes useful to treat these groups of words as equivalent for the purposes of analysis, and sum their counts into classes. ## Document-feature matrix of: 7 documents, 2 features (14.3% sparse). ## 7 x 2 sparse Matrix of class "dfm"
## Dispersion: poisson; direction: 2 < 1; 14 documents; 5140 features. ## Document-feature matrix of: 14 documents, 1,263 features (64.5% sparse). ## [1,] "kind"        "failed"    "benefit" "fianna" "alternative" "system"
## [2,] "imagination" "strategy"  "child"   "fáil"   "citizenship" "fianna"
## [3,] "policies"    "needed"    "fianna"  "side"   "wealth"      "recovery"
## [4,] "wit"         "ministers" "per"     "level"  "adjustment"  "welfare"
## [5,] "create"      "system"    "day"     "third"  "breaks"      "fáil"
## [1,] "irish"       "society"      "taoiseach" "fianna"   "rate"
## [2,] "benefit"     "enterprising" "fine"      "fáil"     "benefit"
## [3,] "child"       "sense"        "gael"      "national" "local"
## [4,] "said"        "equal"        "may"       "support"  "reduction"
## [5,] "opportunity" "nation"       "stimulus"  "poor"     "investment"
## [1,] "welfare"      "million"    "levy"    "reduction"  "welfare"
## [2,] "government's" "create"     "million" "million"    "continue"
## [3,] "much"         "support"    "carbon"  "recent"     "support"
## [4,] "taxation"     "investment" "change"  "investment" "enterprise"
## [5,] "earners"      "key"        "welfare" "rate"       "million"
## [1,] "taoiseach" "society" "measures" "care"
## [2,] "employees" "just"    "review"   "welfare"
## [3,] "rate"      "face"    "welfare"  "per"
## [4,] "referred"  "child"   "spending" "allowance"
## [5,] "debate"    "case"    "million"  "hit"